Switch has a limit on the amount of screenshots you can take. When using the system’s internal storage, it caps off at 1,000 images. The microSD card can hold a much more significant amount. With the external storage, it’s possible to store 10,000 screenshots. 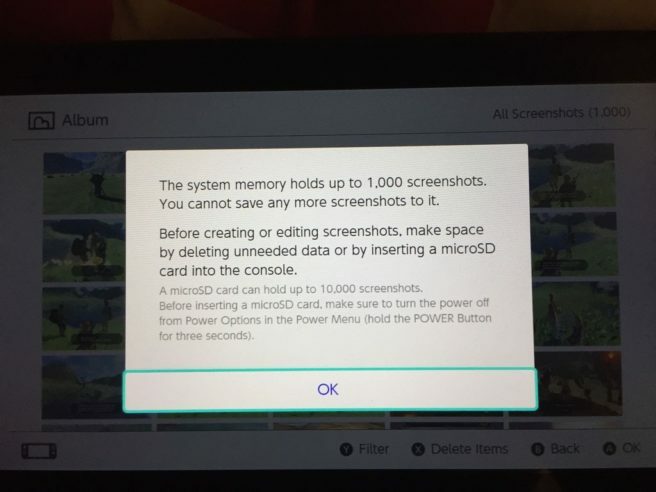 The limit of 10,000 isn’t impossible to work with, but the restriction of 1,000 from Switch’s memory can be more difficult to handle. Given how Switch’s internal memory only contains about 26GB of free space, purchasing a microSD card is advisable.